In 1633 Isaac Gilsemans signed a notary document in Rotterdam. We learn from this and from his parents’ wills that he was then 27, that his father was a pastry cook, and that he had previously served in Dutch naval operations against Spain under Lieutenant-Admiral Philips van Dorp. His signature already showed the ornamental flourishes that typified much of his later handwriting for VOC. And this is all we really know of Gilsemans till 1633 (Anderson, Merchant of the Zeehaen, pp.35-37). Later that year he boarded the Retourship Frederick Hendrick and traveled as a passenger to Batavia. On June 10th 1634 he enlisted there with VOC for a five year term (ibid, p.38). On his arrival in Batavia he held the military rank of ‘corporal’, but he enlisted with the VOC as ‘sub-cargo’ or ‘junior merchant’, in effect a sort of clerk (Heeres, Life 107). As we will see he also had some drawing and surveying skills. 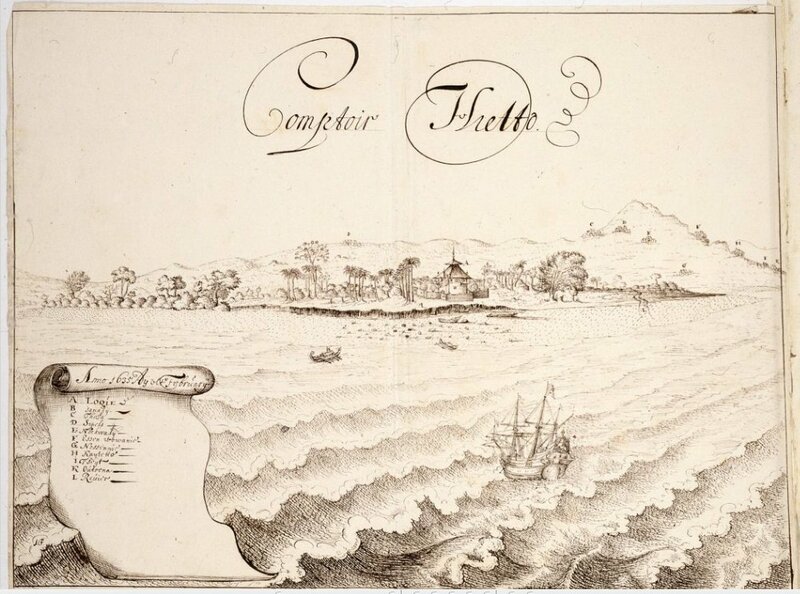 Amboina, on Ambon Island in the Moluccas was VOC’s East Indies headquarters from 1610 till 1619, when Governor General Jan Coen founded Batavia to take its place. Artus Gysels served in Amboina from the time that he arrived there aged 18 in 1611. Starting out as a ‘junior factor’ he was promoted to Merchant in 1615 and to senior merchant of Hitu in 1617. Gysels was critical at first of Coen’s ruthless imposition of VOC trade monopolies. 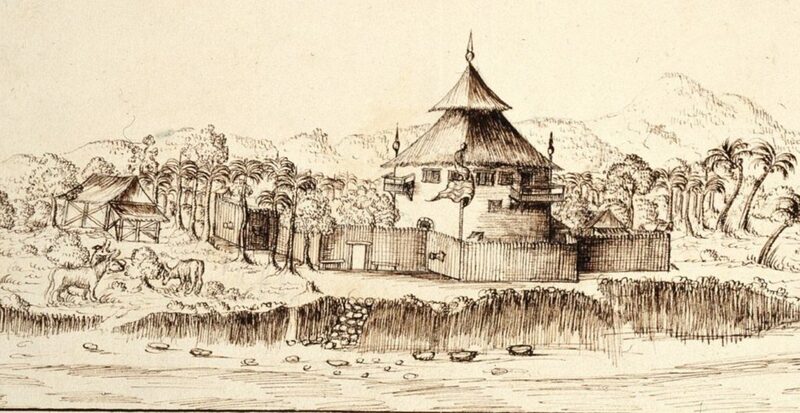 Demoted by Cohen for freeing captured Javanese junks Gysels was in the Netherlands from 1626 till 1629 and managed to restore his reputation there, returning to Batavia in 1630 and becoming Governor of Ambon in 1631. The Ternate Sultanate was represented in Amboina by a hereditary Hitu monarchy. In 1634 the reigning Hitu Rajah was succeeded by a leader known as ‘Captain Kakiali’ who with the help of Islamic kingdoms in Ternate and/or Gowa waged war against the VOC until they had him killed in 1643. In 1634 Gysels was recalled to Batavia and replaced as Ambon’s Governor by Anthonie van den Heuvel, a protege of Governor General Hendrik Brouwer. Soon after his appointment Van den Heuvel imprisoned Ambon leaders, possibly including Captain Kakiali in Fort Victoria. The Ambonese regarded these imprisonments as treacherous and with the help of Makassar rebelled against the Dutch (both the two links above lead to an Indonesian text. Few English narratives seem to exist online. It’s possible in Chrome to right click and ‘translate to English’, which allows an English speaker at least some idea of how these events are understood today where they took place). There is an Abel Tasman tie-in with these wars: in April 1634 the yacht Weesp, Abel Tasman as first mate, delivered Van den Heuvel to Amboina. In May Van den Heuvel, after replacing Gysels as Ambon’s Governor, made Tasman skipper of the Mocha and as such he was involved in fighting Islamic Ambonese and their northern allies. Between October 1634 and April 1635 the Mocha was involved in the blockade and siege of Luciela. The Dutch had finally to lift that siege, but during it Heeres tells us Tasman “was fortunate enough … to prevent the escape of the imprisoned native magnate Kakiali, a ringleader in the resistance, and one of the most dangerous adversaries that ever opposed the Company in Amboyna”(Life p.11). With Tasman on the Mocha it is interesting to wonder just what did take place; was Kakiali on the run from the Dutch, perhaps from Amboina’s Fort Victoria, or was he in Dutch custody on the blockading fleet? In either case he can’t have stayed a prisoner very long if he went on to be a war leader against the Dutch in 1635. 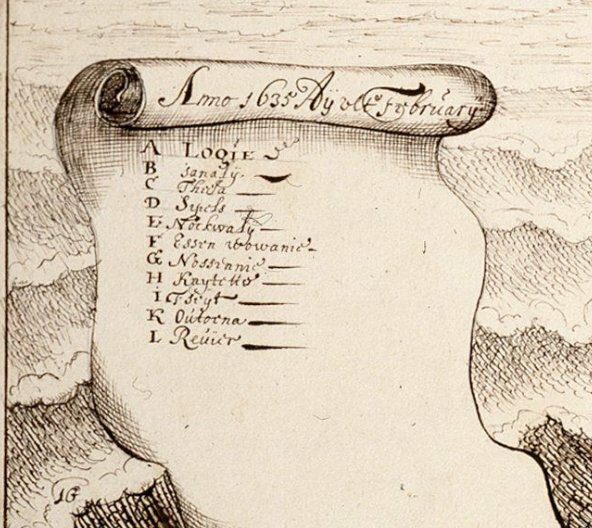 In 1634 while Tasman was at Luciela Gysels was sent again to Ambon, this time as VOC’s Inspector General. He was to discharge Van den Heuvel who was now seen as incompetent, and, if within his power, sort out the unrest caused by that man’s policies. This much we learn from Meilink-Roelofsz, in “The Private Papers of Artus Gijsels as Source for the History of East Asia, Journal of Southeast Asian History (1969)” Anderson tells us that when Gysels returned to Ambon in Oct 1634 he was not reappointed as it’s governor but was to carry out instead “an important regional survey for the Company”. Either at that time or soon afterwards Gilsemans began to work for Gysels as a ‘clerk’ (p.38). 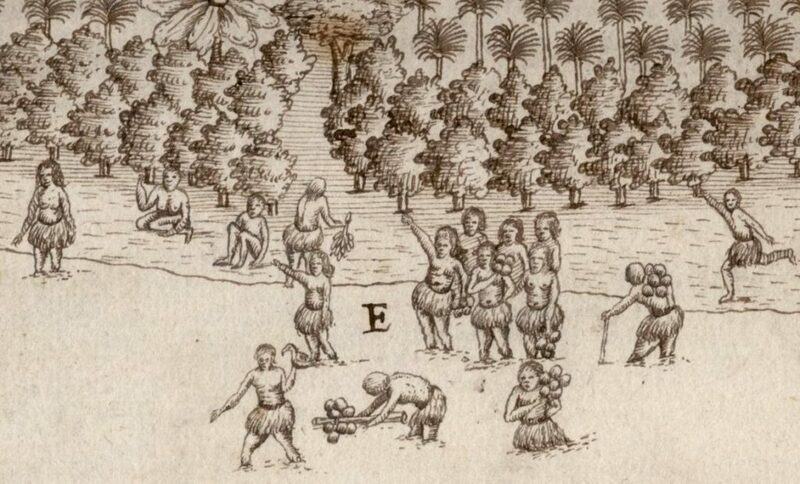 Anderson later states that Gilsemans was with Gysels in the Moluccas in 1635-36 (p.144) and tells us Hietto on Ambon was one of the shore bases visited by Gysels and his party in 1635. As the above link shows ‘Hietto’ is identified by atlas of mutual heritage as Hitu Lama on the Ambonese north shore. It also seems to be the ‘Hitu’ base which Gysels was appointed to as Senior Merchant in 1617, aged 24. Meilink-Roelofsz also reports that in that year: “he had the task of ‘luring the Islam leader in Hitu … into the lodge and of bringing him by ship to castle Victoria”. This sounds uncomfortably close to what, when Van den Heuvel did it, set off the revolt of 1634. No wonder that the Trading post Gilsemans called ‘Hietto’ needed to be fortified: “In the early days of the VOC it became the trading post in this region. The first fort the Dutch built here was a simple enclosure with palisades. Trying to save on personnel costs, the post was abandoned and reinforced several times. In 1642 the post nearly fell in the hands of Makassar troops” (Fort Lyden). Hitu Land was an ancient Islamic monarchy whose monarchs exercised secular and religious power. As such they were roundly despised by Calvinists: Gysels described the Hitu monarch as ‘the high pope’ and ‘that evil fox’. Not all of Ambon’s peoples were Islamic at this time. The Portugese, arriving there in 1512, converted some to Christianity while further inland were communities of polytheistic head-hunters known as ‘Alfurs’. The VOC enlisted both these groups in wars against Islamic Ambonese. In 1635 Joachim Roelofsz was appointed Amboina’s new Governor. Gysels apparently continued his ‘important regional survey for the Company’. About this time the Sultanates of Ternate and Gowa quarrelled over the ownership of Buton and Ternate sought Dutch help against Gowa. Help was provided on conditional that the Ternate sultanate abandoned the Islamic Ambonese, and this may have led to the destruction of many cloves-growing villages by officers like Tasman and Gysels. Meilink-Roelofsz writes of such raids: “the main victims of the punitive expeditions were the villagers, whose houses were razed to the ground, wives and children massacred and means of existence wiped out by the destruction of the clove and coconut trees.” War and destruction set the scene for much of Gilsemans’ earlier art. The scroll title gives the year as 1635, and month as February. Discreetly placed at bottom left are what have now been accepted as Isaac Gilsemans’ initials. Anderson writes that even if the drawing were not so inscribed “it can readily be identified as his work by the calligraphic style of its captions and the alphabetic legend in the scroll … The flowing embellishments, distinctive capital letters, and back swept tails are evidence … almost as convincing as his full signature would have been” and the initials also show “he claimed responsibility for the whole illustration, not just the lettering (The Merchant of the Zeehaen, p.144). This is substantial and convincing cumulative evidence and Badische Landesbibliothek, which owns the original (along with other images apparently by the same artist that relate to ‘expedition A. Gijsels’ lists as its two creators Isaac Gilseman, draughtsman and Artus Gijsels, commissioner. We can be confident the drawings of Tasmania from the Huijdecoper manuscript are the work of Gilsemans (ibid, p.81), and while these differ markedly from the drawings of that coast in SAC made on the same days and (as I see it mistakenly) often attributed to him they seem to match the style of his ‘View of Hietto’ hills. Compare the subtle rounded skylines unlike those in SAC and the distinctive stippling that suggests contours and distant vegetation. So we can fairly confidently say ‘View of Hietto’ is by Gilsemans, and matching drawings of Hietto illustrating ‘expedition A. Gijsels’ seem clearly to be his as well. This view of the Hietto Trading Post takes us much closer in and shows more of the artist’s drawing skills. It is so detailed you almost hear the cattle munching and flag flapping on the pole. SAC’s illustrations when depicting settlements always employ the ‘bird’s eye’ view, but this does not. They also often show us crowds of distant people with a few enlarged. In this there aren’t any people to be seen. People are seldom shown in Gilsemans’ mid 1630s art. 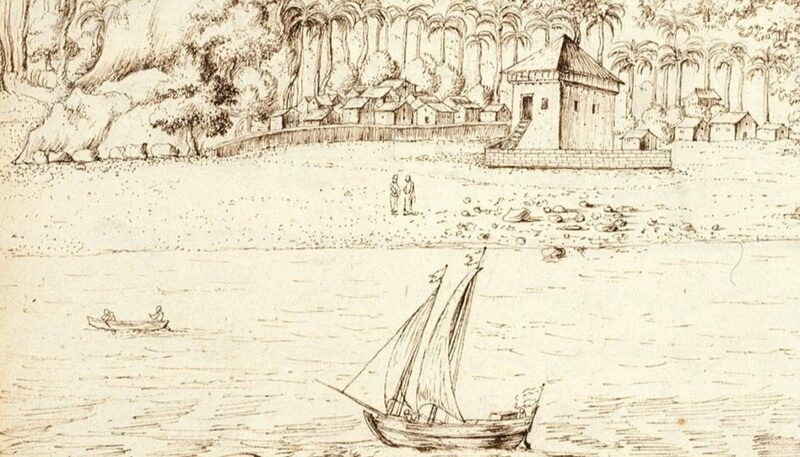 There are some though in this sketch of the Island of Oma, a few in boats and two apparently conversing on the shore. They’re rather linear and two dimensional, unlike the energetic solid looking figures in this Tongan detail from SAC. The people here show greater character and energy than his, although the trees do not. Gilsemans’ talents do not seem to run to drawing people, but he has a lot of other skills.